My sister had the recipe for college chicken casserole on an index card in her recipe box. The original source was a Cooking Light magazine issue from May 1998. Some time during the last decade, her index card was spilled on and only partially legible. Luckily, nearly everything survives on the Internet. 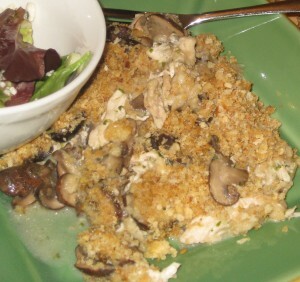 I found a legible version of College Chicken Casserole on myrecipes.com. The original version was created to lighten up someone’s college memory food, a casserole containing sauce, chicken, and cremini mushrooms. I’d guess the original version probably contained cheese and butter as well. I’ve probably gone back and fattened it up a bit, but that’s just because I don’t own or use cooking spray. I had an olive oil mister once, but the thing kept getting clogged and generally didn’t work very well. I wound up making quite a few other changes to arrive at my own version. We’re still out of white wine, so I again went with vodka. I think chicken is highly preferable roasted, so instead of boiling it like the recipe requests, I roasted chicken breasts, then used less water and more chicken stock to provide a base for the sauce. I didn’t have dried basil on hand and probably wouldn’t have used it if I had, so I opted for a bay leaf and fresh Italian Parsley mixture that gave the stock a lovely color. I also used my homemade breadcrumbs instead of herbed stuffing. Then to top it all off, after nearly abandoning ship on the recipe entirely, I failed to notice they only wanted you to use 2 of 4 cups of chicken broth, so my liquids were off and I wound up with a thinner and cooked much longer sauce. I’d like to point out that the technique for separating the fat from homemade chicken broth in the Cooking Light recipe is pretty novel. I’m hesitant to put hot things in plastic, and actually, hesitant to waste plastic in general, but it does seem like a handy trick to keep in the back of the mind for just in case situations. Also, were chicken breast halves REMARKABLY smaller in 1998? I can’t remember, but the recipe calls for 6 breast halves and 4 thighs, I used 3 chicken breast halves and wound up with the required 4.5 cups of shredded chicken. *Shrug* go figure. Decent casseroles, let alone healthy casseroles, capable of being prepared in advance, then say, delivered are almost non-existent. The whole reason my sister and I were discussing casseroles to begin with was due to me considering purchasing Park Avenue Potluck: Recipes from New York’s Savviest Hostesses. I was guessing it wasn’t going to contain a recipe for broccoli, rice, and cheeze casserole. I glanced through it quickly, and it didn’t actually strike me as portable or potluckable food at all. I may definitely have been to quick to judge though. If you have this cookbook, please leave me a comment in the comment section – or email me lane@dinnerandconversation.com – I’d love to hear your thoughts. Preheat oven to 400. Drizzle rinsed and dried chicken breasts with olive oil. Sprinkle with salt and pepper. Roast in oven for approx 40 minutes or until chicken reaches and internal temperature of 165. Remove skin and bones from chicken, shredding meat using forks. In a sauce pan over medium heat, combine, chicken broth, water, vodka, parsley, bay leaves, and garlic. Cook on medium heat, reducing to a quantity of 2 cups, approx 45 minutes. Grease a 9 x 13 casserole with 1 tbsp olive oil. Line bottom of casserole with shredded chicken. In a saute pan, heat 2 tbsp olive oil on medium. Add mushrooms, saute until soft and moist. Remove mushrooms and reserve. If saute pan looks dry, add another tbsp olive oil, then flour. Cook until paste-like and flour assumes a slightly yellow color. Add milk, whisk until smooth and thick. Add broth mixture and cook over medium until thickened, whisking nearly continuously, about 10 minutes. Add mushrooms then season to taste with salt and pepper. Pour mixture over chicken. In a small bowl, pour butter over breadcrumbs. Stir to combine then sprinkle evenly topping the chicken and sauce. Bake 20 minutes or until bubbly. I agree, it would be nice to see casseroles on restaurant menus more often. At my office cafe , the casserole dishes ALWAYS sells out quickly. Who doesn’t love the combination of cheese, rice or pasta, some sauce and a bit of meat all baked and gooey. Does your sis blog about her meals? What kind of office cafe is it Linda? Could you slip them some recipe suggestions? I’m a soup gal myself – first and foremost, I would always order a lunch soup! Allison is a super busy career woman and mom, so very unlikely to take up blogging. My little sister might take it up some day though! She’s talked about a restaurant review blog before.